Blooms on the magnolia tree between Hovey Cottage and Kane House given in October 2008 “in loving memory of Susan Veatch Cantrell” by her friends Cynthia Sommer, Mary Kummings, Diane Tapia Quinn, Sandra Ramsey Fanning, and Susan Shearer Rickett. Steve Charles—Last week I stopped by Class Notes Editor Karen Handley’s office to let her know that the magnolia tree planted in honor of Susan Cantrell by her friends was blooming. She smiled, but I could tell something was wrong. Which didn’t make a lot of sense to me. We had just finished proofing Karen’s section in this issue of the magazine, classes were winding down, evening events were almost over, music was throbbing from a couple fraternity houses, and spring was finally here. I was feeling pretty good. But Karen had just proofread the In Memory section of Wabash Magazine. It was an unusually long section this time, and we’d lost a number of alumni Karen had worked with or written about during her 30 years at Wabash. Part of Karen’s job is gathering and editing the obituaries for each issue, often resolving conflicting information from multiple sources, searching the Internet for a fact or story that somehow defines the person to make these short pieces more than just a “death notice.” It’s a thankless task and usually anonymous, unless we get a fact wrong. That’s about the only time she hears about it. Many college magazines avoid the problem altogether. They simply list the name of the “deceased,” the class year, and date of death. But for Karen—who in our Class Notes insists on listing not only the names of babies born to our alumni families, but the baby’s weight and length and brothers and sisters (“That matters to the parents,” she insists. )—a name, class year, and date of death isn’t enough. Not in a community where fewer than 200 men graduate every year, where so many faculty and staff teachers spend most of their careers. And often, Karen really does know these guys, at least by name from a Class Note, or—as she noted when we lost long-time Class Agent Dutch Friese ’48—from receiving their Class Agent letters. It was a beautiful day outside, but nothing I could say could shake Karen’s lingering sense of loss, and I realized that, in varying degrees, she goes through this every time we publish. I’m the fortunate one in the process—I take Karen’s obits and go online to add to them or to find remembrances or ask others to write about their friends or write about them myself and I often hear back from grateful family members. At the minimum I have the satisfaction of getting to learn more about the person than I knew before; I am often amazed by the alumni I meet in the loving words of others. But none of that happens without Karen’s conscientious and faithful hard work. Hers is the historical record. And there’s power in those names and details she gathers. Our production schedule makes it inevitable that most of our remembrances are published four to six months—or even a year—after the person’s death. It’s a time when everyone has gone back to work, back to their daily lives, and a most difficult time for close family members who feel like the person they so loved is being forgotten. I like to think that when a spouse or child of our alumnus opens that issue of the magazine and reads that name, they know their loved one is not forgotten, not by his alma mater. Karen makes sure of that. She knows these guys. And every issue of Wabash Magazine is bound and placed in the College archives, so that years, decades, perhaps even centuries from now, someone will open those bound volumes searching for a name and, thanks to Karen, they will find it. I wish I’d been able to cheer her up last week, but I left more grateful than ever for her work. And I thought you should know that when we lose someone here, the name is carried with great care, even a measure of grief, by a woman determined that the person you love will not be forgotten. 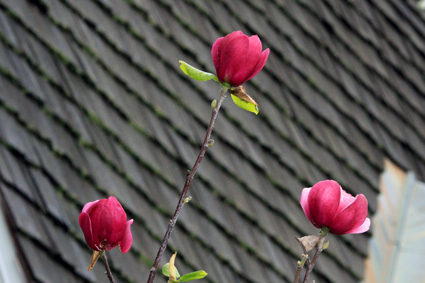 The names and remembrances that Karen gathers are like that flower on the magnolia tree that our colleague Susan Cantrell’s friends planted for her; its bloom reminding us of our friend is too brief. But it comes back, year after year. As long as the tree lives on, we will always be reminded of Susan. As long as Wabash lives on, so will our memories of those in the Wabash community that we’ve lost, and you can thank Karen Handley for that. 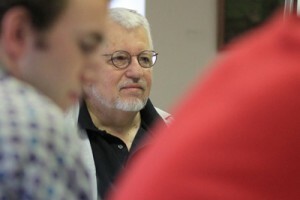 Dan Simmons ’70 listens to a student writer during last week’s Wabash Writer’s Workshop. I’ve worked at Wabash almost two decades, seen many young lives transformed, but I’d never heard those words here until Lucas Zromkoski ’15 said them to me during last week’s Wabash Writer’s Workshop. I should have seen them coming. It was the second day of the three-day intensive workshop and Lucas had just spent more than an hour listening and taking notes while five of his peers and Dan Simmons ’70, the College’s most dedicated and successful professional writer, critiqued Lucas’s short story, “Shatter.” The students were honest, meticulous, tough, and helpful with both their praise and criticism. Simmons was taking it down to the word. “I’m going line by line here, but that’s what I do when I like a story,” he said before he offered specific suggestions and wondered aloud about word choices to improve the piece. Lucas listened intently, jotting an occasional note for his revision, determined to make the story better. 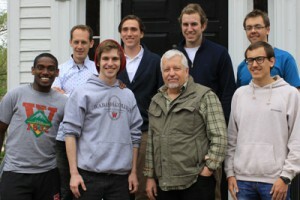 When Dan finished, fellow student writer Nick Gray ’15 offered his own suggestions. It was that kind of week, that kind of workshop. And it started, of course, with another story. At dinner before the sessions began, workshop co-organizer and Wabash English professor Eric Freeze had heard more about Dan’s career before he became the professional writer of science fiction classics, mystery, horror, fantasy, and mainstream novels. For 18 years Dan was an elementary school teacher, creator of the APEX program for gifted and talented students. But even back then, Eric learned, Dan would tell stories, beginning a tale at the start of the school year and spinning it daily in such a way that kids who were sick and supposed to be home showed up at class anyway so they wouldn’t miss anything. Then he shared why he was at Wabash that week, volunteering his time, despite the fact the proofs for his novel, The Abominable, were late and waiting on his desk back in Colorado. He said the move from amateur to publishable professional writer was analogous to an electron moving from one orbit to another, a quantum leap very few have made. Then he and the students went to work. They shared favorite writers, discussed character and the free indirect style described in James Woods’ How Fiction Works, read passages from Hemingway, James, Flaubert, and others (with Simmons interjecting historical background from each like the rabid researcher he is). They broke down paragraphs by thought units, analyzed word choice and sentence cadence. 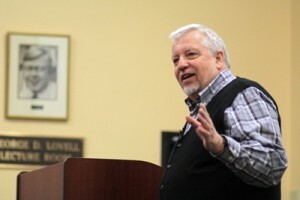 Dan showed the proper format for submitting manuscripts, the mistakes editors look for to reject stories. After the first critique circle (to gain admission to the workshop, each student had submitted a manuscript) I could tell something special was happening. 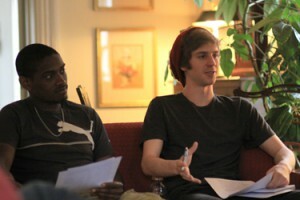 Eric has been developing a community of writers since he arrived at Wabash five years ago, training them to be generous with both their praise and detailed criticism, to be thick-skinned enough to hear those things about their own writing, separating themselves from their work so they can get better at the craft. Lucas Zromkoski talks with Dan Simmons during a critique circle at the Caleb Mills, as Nick Gray, left, listens. So the professor had his students ready. Simmons seemed pleasantly surprised. He told Stephen Batchelder ’15, the writer of that piece: “Reading this story made me realize I had to do this workshop, not because you needed my help, but because this story was bold. You have a powerful voice, and a lot of courage. The story wasn’t finished; it has a long way and many revisions to go, as do all the pieces. But in their critiques Dan and the students had pointed ways forward, and Stephen seemed eager to rewrite. It was the sort of interaction those at the College who know Dan have envisioned for years. Folks like Alison Kothe and Pat White knew that, regardless of his continued financial success (Dan’s book, The Terror, is in development for a series at AMC), the best gift the College’s greatest practitioner of the art and craft of writing could give was his time with our students. That goes beyond teaching. When I returned to photograph the sessions after what was supposed to be a short break, I found Dan, the six students, and Eric at a round table in Detchon, laughing and sharing stories way past the allotted 15 minutes. A similar scene was repeated at lunches, with Dan’s wife, Karen, present, and at the final dinner on Saturday night. In one of the those conversations, students heard how Karen had encouraged her husband to keep writing, even when he was ready to quit, how she was his not only his best friend but most trusted reader. “Maybe some day you will be so fortunate to find that person,” he said. Chet Turnbeaugh wrote: “Working with Dan has encouraged me to continue writing—not only the short story I submitted for the workshop, but, in general, to push towards new creative horizons that expand the possibilities of my imagination. Christian Lopac wrote: “The things we learned showed me the challenges associated with writing, but the workshop also illustrated many of the things necessary to make the ‘quantum leap’ Dan spoke of. Pictured with Professor Eric Freeze and Dan Simmons ’70 are students from the first Wabash Writers Workshop: Nick Gray, Lucas Zromkoski, Chet Turnbeaugh, Stephen Batchelder, Chistian Lopac, and Ryan Horner. What’s next? Dan has a couple of generous and once-in-a-lifetime ideas, and both he and Eric have imagined a weeklong workshop for a time when the College is not in session, addressing a frustration voiced by Zromkoski, who after the encouraging yet challenging critique of his story wanted to get to work on a revision immediately, but admitted he had a 20-page paper, Japanese homework, and a yearbook to finish in the next few days. ‘What if we had an entire week to focus only on our writing?” he wondered aloud. Right now, though, I’m savoring what I witnessed last week. I’ve seen inspiring things during my time at Wabash. I was 20 feet from Kurt Casper when he grabbed Ryan Short’s tip to the end zone and won the Monon Bell with “The Catch.” I was here when the College cancelled afternoon classes and converged on Detchon Center for the first Celebration of Student Research, Scholarship, and Creative Work. For more than a decade, every time Bill Placher wrote a book, I got to be one of the first to interview him, a personal lesson in theology and faith from a master writer. 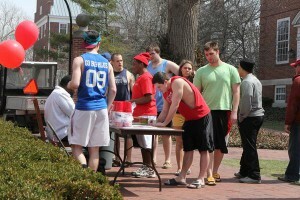 But I’m with Lucas on this one: In my life at Wabash, I just witnessed the single most amazing moment. Jim Amidon — When Wabash College senior Rashaan Stephens met with me about six weeks ago, he came with an idea to do a fund-raiser for the Montgomery County Free Clinic. So I sat down and talked with him about all the little details that would need to be planned in order for his event to be successful. Most of the time when a fund-raising event involves a million little details, the students get overwhelmed. With the burdens of their classes, sports, and activities, the fund-raisers tend to be good, but often unrealized ideas. I should have known Rashaan would see his idea through to a successful conclusion. See pictures from Saturday’s event here. You have to meet Rashaan to get a sense of his enthusiasm — for travel, life, studies, and Philly cheesesteaks. He’s like a human tornado who is always on the go. Our conversation about the fund-raiser was a blur. We talked about all those million little details in minutes, and when he left, he was literally undaunted. I didn’t hear from him for about 10 days so I thought the pressures of mid-semester probably got the best of him. I was wrong. He spent that time meeting with our food service partner, Bon Appetit, and lining up workers from the organization he leads on campus, the Muslim Students’ Association. Everything came together perfectly on Saturday, including the season’s warmest day of the year so far. 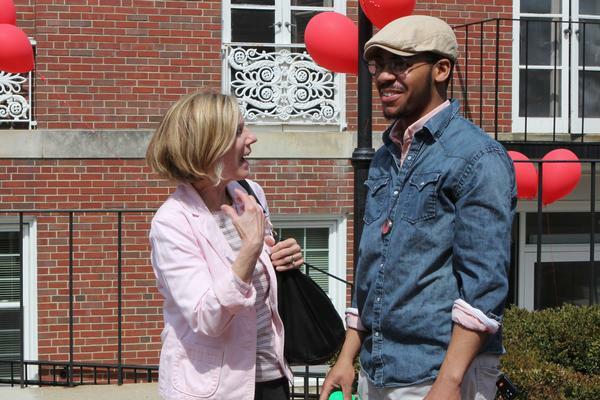 Under bright sunshine, Rashaan, Tyler Griffin, the MSA, and the Malcolm X Institute of Black Studies set up tables outside the Scarlet Inn and decorated the whole area with red balloons. I arrived shortly before the event started, and Rashaan was busily running all over campus. He couldn’t even stop long enough for a photo. But I found Bill Doemel, who is executive director of the Free Clinic, and we talked about the significance of the fund-raiser. The clinic will provide free healthcare to uninsured people of Montgomery County, and over the last five years, a dedicated group of volunteers have managed to raise $300,000 in funds to match a $900,000 grant from North Central Health Services. Located on Mill Street near Milligan Park, the clinic is set to open mid-summer. Right now the volunteers and board members are raising operational funds. That’s what Rashaan and the MSA brothers wanted to support. Rashaan Stephens is a Muslim. The Free Clinic is growing out of the long-standing Christian Nursing Service’s Well Baby Clinic and Adult Clinic. The Muslim Students’ Association wanted to demonstrate the true tenets of Islam, and those students worked tremendously hard to show they care deeply about this community and all of the people who live here. Local chef Adam Laskowski manned the flattop in the Scarlet Inn and made it look like he’d been slinging Philly cheesesteaks all his life. 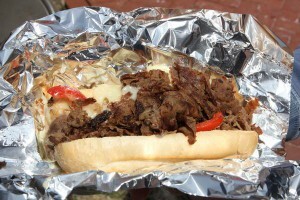 Let’s talk about those sandwiches, too: Beef steak and fresh-baked rolls flown in from Philly. You got your choice of provolone or Cheese Whiz, peppers or onions, or both. I had mine with provolone and could not believe how terrific the sandwich was. As I sat in the sunshine with my wife, Chris (a Free Clinic board member) and Bill Doemel, I had a sudden urge to get another sandwich. This time with Cheese Whiz, at which Bill grimaced. I returned with the slightly sloppier, bright orange cheese-covered sandwich and had it polished off in about 90 seconds, which included allowing Chris to sample two bites. It was even better than the first sandwich. By this point, a large crowd had gathered and the fund-raiser was up and running. 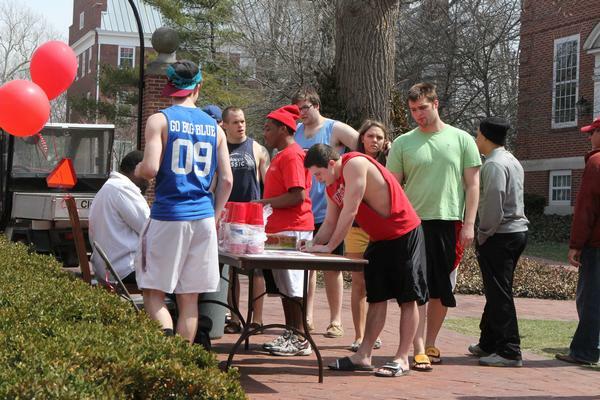 Several fraternities provided funds to allow all members to eat there Saturday afternoon. We left about an hour into the event. Rashaan was still running around like a crazy man making sure every detail was covered. I asked Tyler Griffin how many sandwiches he had sold in that first hour. He laughed (he always laughs) and said, “I have no idea — this many” and he showed me his cash box stuffed with money that will soon help support our neighbors in need. Needless to say, I left feeling exceptionally proud of Rashaan, Tyler, Nick Gray, and all the students who pitched in to make the Cheesesteak Festival a rousing success.